Transcultural and cross-disciplinary summer workshop from 14 July – 10 August 2014 in cooperation with Zurich University of the Arts/Switzerland. We are looking for 15-20 BA- and MA-students from various disciplines and all schools at HKAPA and other institutions in South East Asia who are interested and curious to get involved in an exceptional 4 weeks summer programme. In collaboration with students of Zurich University of the Arts we will develop performative, interactive and scenographical projects that will be presented to the public in a city environment. After 5 years of experience between Beijing and Zurich, the workshop called „Common Stage“ takes place for the first time in Hong Kong. Central to the project are practical artistic collaborations between various cultures, art forms, and disciplines. Participants will work in mixed groups of 5-7 students. The various traditions will be explored in interdisciplinary experiments and the cultural differences are rendered visible for an audience in an open artistic format. Parallel to the practical work thematic and theoretical inputs are incorporated into the process. This makes it possible to observe and reflect on one’s own culture and that of others, as well as to develop innovative forms of artistic expression. An interdisciplinary team of lecturers from Europe, China and Hong Kong will be supervising the students. Zurich Unversity of the Arts is one of the leading art universities in Europe. It offers programmes in theatre, film, dance, classic/jazz/pop music, fine arts, media, design, cultural analyses and cross-disciplinarity. The summer workshop takes place at HKAPA as well as at the ZHdK Project Space at North Point. Next to a total of 25-30 students of HKAPA and ZHdK, students of other universities are likely to participate. “To Live a Happy Live” is the title of this years workshop. We are interested in the current and various living conditions in Hong Kong, China and Europe, researching different ideas and ideals of a “good life”, reflecting existing traditions, our values and orientations for the future. We are looking forward to your application until 10 March 2014. Please write a short description of your motivation to be part of this project to Prof. Ceri Sherlock for HKAPA applicants, all other institutions to Daniel Spaeti. We are explicitely looking for students from all schools of HKAPA and other instituions and we emphasize on a good mixture of disciplines. Born 1970 in Switzerland, designer and cultural entrepreneur, since 2001 lecturer at Zurich University of the Arts in BA and MA Design with specialisation in design strategy, staging, event, and transarts/cross-disciplinarity. In 2008 he initiated and leads „Common Stage“ which is the most comprehensive international exchange programme of ZHdK at the moment. In this position he is also involved in establishing a future ZHdK Study Centre in Hong Kong in the coming years. He is research associate in national research projects in the field of design, event culture and urban development. Next to university he works as an independent designer, cultural entrepreneur and director for festivals, conferences, exhibitions, concerts and club-events. Zhao Chuan is a writer, art critic and theatre director who creates alternative, political theatre in Shanghai. He is the founding member and mastermind of the important Chinese theatre collective Grass Stage since 2005. His work devoted to the promotion of new social theatre movement and the creation of non-profit public space. The collective has focused on deepening the connection between theatre and society, and has made use of a wide range of venues and situations for performances and discussions. Grass Stage events are not only spaces for bringing together diverse elements of society, but also provide, in a country relatively lacking in opportunities for public participation, a fluid and varied range of public social spaces. Zhao Chuan’s literary awards include, most notably, the Unita Prize for New Novelists (2001). His writings on contemporary Shanghai art have been selected for publication in various media in China and abroad. His publications include novel, essays and scholarship/criticismon contemporary art. He has also been invited tonumerous international Literary, Art, and Theatre festivals.His theatre works have been performed in many Chinese cities, as well as in Taiwan, Macao, Hong Kong, Japan, Korea, India, Singapore, Italy and Germany. 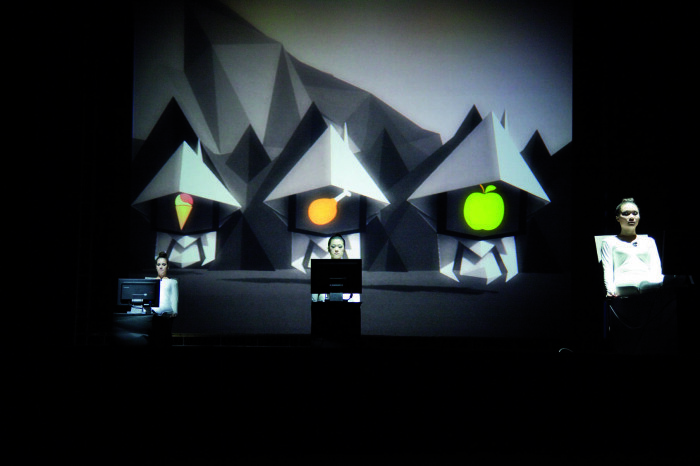 Dimitri de Perrot‘s work links music, composition, direction and scenography. He is co-founder and artistic director of the Swiss theatre duo Zimmermann & de Perrot. Dimitri de Perrot is a highly renowned artist in Switzerland with a wide international reputation.